Silicone Microwave Popcorn Popper Just $12.95! Down From $23! You are here: Home / Great Deals / Amazon Deals / Silicone Microwave Popcorn Popper Just $12.95! Down From $23! Pop some popcorn with this silicone popper at Amazon! Silicone Microwave Popcorn Popper is now on sale for just $12.95 down from $22.95! 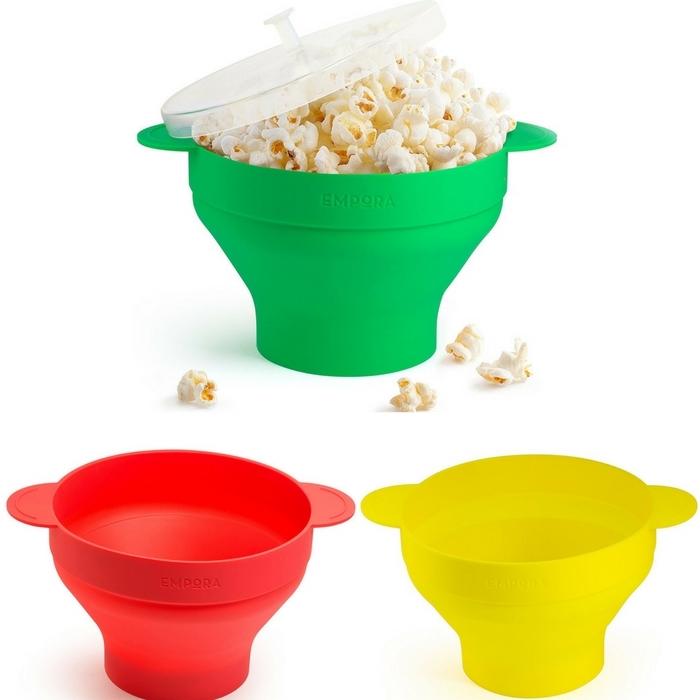 FAST AND DELICIOUS POPCORN: Using nothing more than a cleverly designed silicone bowl, our silicone popcorn popper will make your popcorn in just minutes and pop ALL the kernels! Not only that, your popcorn won’t be overly greasy like the kind you get in bags. FAST TO CLEAN, EASY TO STORE: You can safely drop your popcorn maker in the dishwasher or just wash with some hot water and soap to clean up in seconds. Nothing sticks to this popper, not even granulated sugar. And once you’re done, you can collapse down the popcorn maker to just 2 inches. GREAT FOR MAKING HEALTHY SNACKS: Unlike store-bought popcorn bags that contain potentially harmful amounts of sodium and sugar, our popcorn maker can make popcorn without oil so you can easily produce a truly healthy snack. Plus, it’s 100% BPA free, so there are no worries when microwaving popcorn. A GREAT GIFT: Our popcorn maker is a healthy, fun and delicious gift – after all, who doesn’t like popcorn? And to make it extra special, our popcorn maker comes in a lovely colored gift box that will delight any friend or relative on holidays or birthdays.